Maine is home to the largest population of black bears in the lower 48 states. Our bears are most active between April 1 and November 1. When natural foods are scarce, especially in the spring or dry summers, bears will venture into backyards and fields in search of easily accessible food such as bird feeders, garbage, grills and pet foods. While hundreds of conflicts between bears and people are reported each year in Maine, many can be prevented by simply removing or securing common bear attractants. Removing these food sources will also limit other backyard visitors (raccoons, skunks, etc.). Avoiding bear encounters in the woods, your neighborhood, or backyard. 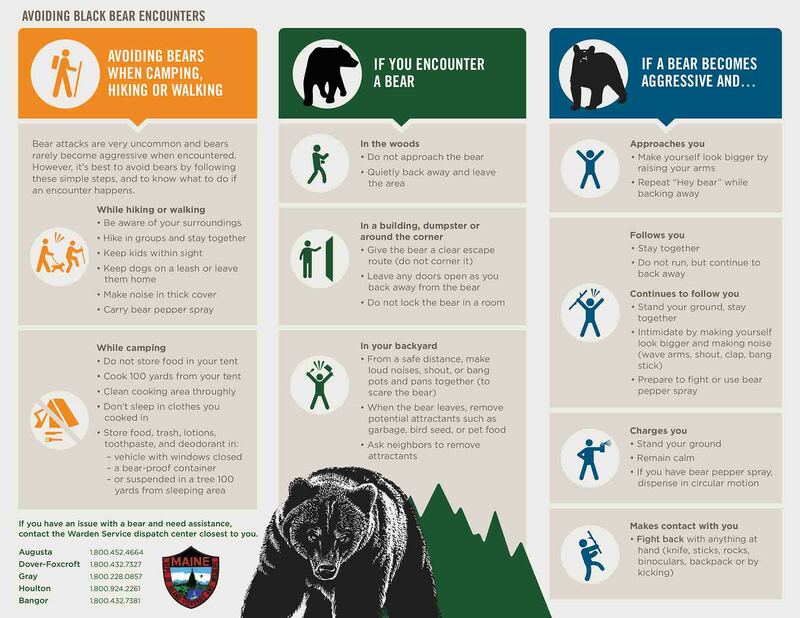 Bear encounters and attacks are rare, but follow these simple steps to avoid and safely escape encounters that do occur. Always report aggressive bears immediately by calling 911. 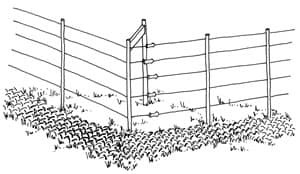 An electric fence designed to keep bears out of an area (Fig 7). This five-wire electric fence has been effective at keeping adult bears and their cubs out. If necessary, a two-foot wide underground apron of chain-link fencing or steel mesh can be staked down and attached to the fence to keep bears from digging under the fence. If wood or other heavy-duty corner stakes are not used, the corner posts will need to be carefully braced. Traditional wire fencing can also be used as a barrier. Use heavy chain-link or woven-wire fencing at least six feet high. Install 24-inch long wood or metal bar extensions at an outward angle to the top of the fence with two strands of barbed wire running on top. If necessary, a two-foot wide underground apron of chain-link fencing or steel mesh can be staked down and attached to the fence to keep bears from digging under the fence. 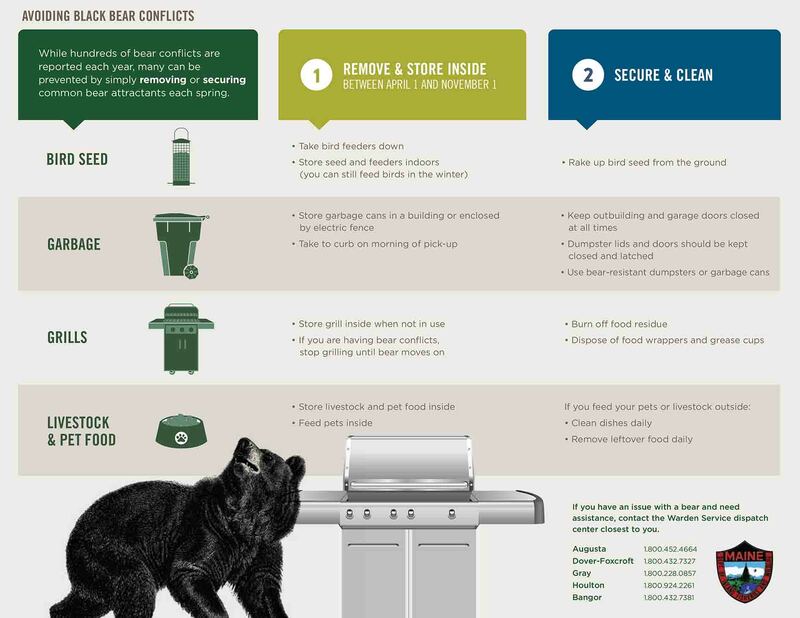 The most effective long-term solution to conflicts between people and bears is removing, securing, and properly storing attractants such as bird-feeders, garbage, grills, pet and livestock foods, livestock, and bee hives. Wildlife offices throughout Maine can provide assistance with securing or removing attractants. Wildlife offices throughout Maine respond to bear sightings only when there is a threat to public safety or property. A sighting or the presence of a bear does not constitute a threat to property or public safety. Typically, no attempt will be made by wildlife agency staff to remove, relocate, or destroy the animal. Although problem bears can be live trapped by specially trained wildlife professionals and moved to more remote areas, removal is expensive, time consuming, and seldom effective. Once a bear has tasted human food or garbage, it will remember the source and return again and again. Bears have been known to cover more than a hundred miles after relocation to return to a human food source. In addition, using tranquilizing drugs on bears to facilitate removal is not without risks to bears and humans. When other methods have failed or the bear poses a threat to public safety, lethal removal of problem animals may be the only alternative. You can help prevent lethal removal by following the recommendations presented above. Contact your regional wildlife office for additional information and, in the case of an immediate emergency, call 911 or the state police. Bears are not considered a significant source of infectious diseases that can be transmitted to humans or domestic animals. Humans can, however, become infected with trichinosis by eating undercooked bear meat. To view information on preparing bear meat, see Center for Disease Control & Prevention. The black bear is classified as a big game animal. A hunting and/or trapping license and bear permit (with the exception of resident deer-hunters during the November firearm season on deer) are required to hunt black bears during a 13-week fall season that opens the last Monday in August and closes the last Saturday in November. If a bear is causing damage or is a nuisance, consult Maine's laws on this subject: See all sections, particularly Subsection #1: Bears, which applies to the taking or killing of a bear found doing damage.